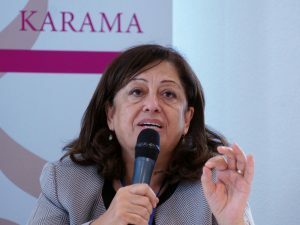 Asma is a lawyer, human rights activist, and current President of Sisterhood Is Global Institute/Jordan (SIGI/J) and Secretary General of the Jordanian National Commission for Women. She is a former Minister of Culture, and Government Spokesperson for the Hashemite Kingdom of Jordan, and former President of the Jordanian Women’s Union. A member of the Arab Lawyer’s Union, the Arab Organization for Human Rights, the Executive Committee of the International Commission of Jurists, and the Advisory Committee of the Women’s Division of Human Rights Watch, Asma has received numerous awards and honors for her work. Asma has written and spoken widely on the topics of women, children’s rights, and human rights. She recently served on the UN International Commission of Inquiry investigating human rights violations in Libya. Asma was a leading voice in the successful campaign to abolish Article 308 of the Jordanian penal code, which allowed rapists to escape punishment if they agreed to marry their victims.